And a couple of days since I started the diet. One month on and I'm seven pounds lighter and it's been all too easy. In another month I'll be back down to my racing weight. A weight I've not been since 2008! It seems almost too easy... There has to be a hitch somewhere doesn't there? I have the focus now. I've been a long time in limbo. 3+ years is a long time to be letting things slip. Somewhere back there I forgot what it's all about. Live to work or work to live? And by live really mean run. Not Sure If I'm Ready For This One Yet? Better than my last 5k. Not difficult as my run in October was truly awful. It was the Pomphrey Sports 5k tonight and in determined mood, I made the start line - and the finish! I wasn't aiming to set the world on fire, just run a bit quicker than last time. I set off towards the back of the pack and little by little picked my way through the field. I took the pace quite easy in the first half, letting the loss of three bags of sugar from around my waist, in a month, do its thing. I know at some point I will have to put in some serious effort but for now I'll just keep easing the time downwards. I decided it was time to start planning some time in the mountains - and I don't just mean the Brecons. 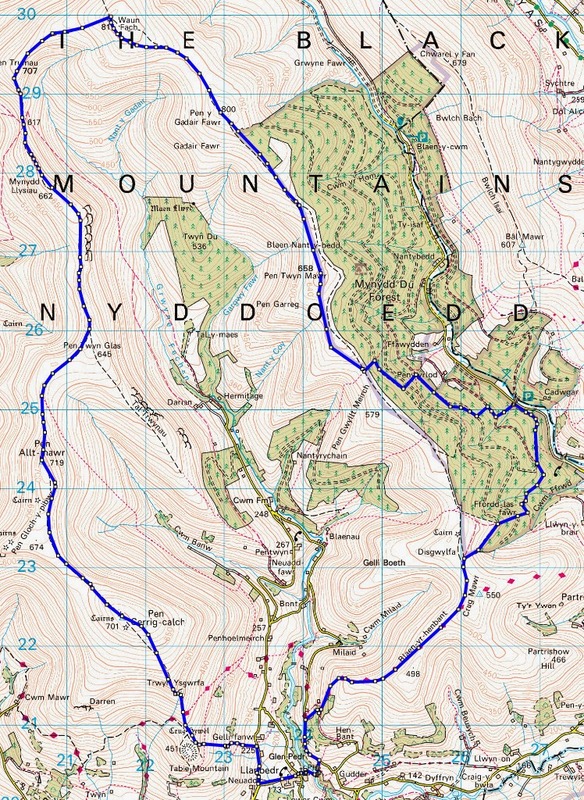 I've pencilled in five possible long weekends between now and June in which to head to Snowdonia for some real proper mountain running. I've also pencilled in three or four long weekends June to August to visit the Lakes. Can't believe I didn't get to the Lakes even once last year! Oh, yeah, and pound six is history! Despite the murk and the strong winds. Character building I think they call it. It actually wasn't too bad out there. It's true, the views weren't great - in those few breaks in the murk - but it could have been a whole bunch worse. In fact, pretty much like the driving rain piling down outside right now as I type. I'm bloody glad I got up at six o'clock to get on the road early. Anyway, after reaching the path at the south end of CyFD I turned upwards and ran the ridge back towards Waun Rydd to keep the mileage up. I remember why I limit my running along that ridge. It get's a little muddy towards the end... I eventually made it to the cross-paths at the end and headed homeward. I found a nice little track just below the Cwar y Gigfran ridge. I was intending to be atop the ridge but I came across the path and, in the tradition of all the great explorers, followed it. As I neared the spur at the end of the ridge (above me) I decided to cut down across the valley before crossing the next feeder stream so I would cross the main river in the valley bottom slightly higher up and with less water flowing. It was a good plan and the crossing safe. With only a few more minutes running left, I made it back to the van in just under three hours. I was happy with that. My route more or less followed that which I had planned with the exception of the 'lower than the final ridge' ridge path. I covered just over 14 miles with 3,000ft of ascent. I did start to tire in the last couple of miles but by then the hard work was done and it was just a case of making my way off the mountain. I finished off the day's training with 45 minutes on the static bike to unwind. I feel things are starting to move in the right direction. Been a hard week at work and I'm feeling tired. Taking a night off from training in order to be rested for tomorrow. Not sure I really want to. I have a feeling the views from the top ain't going to be particularly special but 'want to' and 'need to' are very different task masters. I've decided my route. 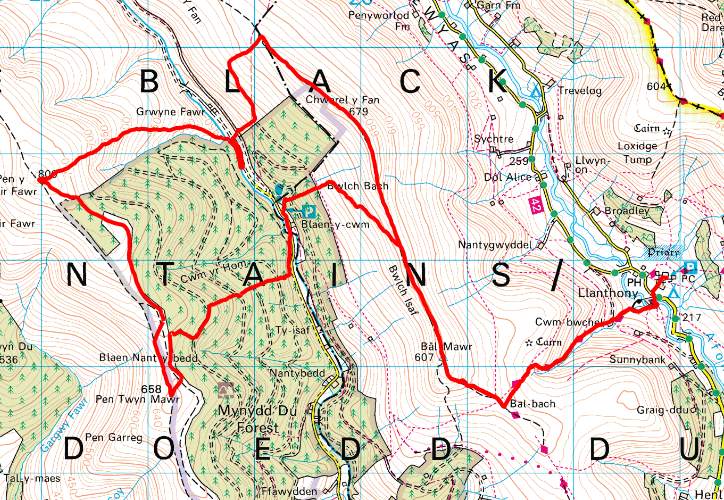 I'm heading to the central beacons and the tourist paths - with a few deviations of course. I have a feeling I'm going to be seeing very few tourists there tomorrow. Still, I kept inside the days calorie target. Pound six won't be more than a few days away. Happy days. Still, on other fronts, pound number five has left the building. Well, I confess I'm feeling knackered. I was on the road by 5:25 to collect some data from one of our works and then down to Bristol. Any later and I would have been caught in traffic hell. I then didn't get away for the journey home till five thirty - no, not five minutes later. Finally home by seven, that was me done for the day. Might be another iffy one tomorrow as well though. Feeling sleepy and it's only eight! If I do say so myself. It was really only training - but then I would say that. Seriously though, I'm keeping my races low key at the moment and putting no expectation on the results. If they're good then that's a bonus. At the moment I'm just happy to be coming back. With travel arrangement made, the Terrific Three became the Fabulous Four at Monmouth as I joined the party. We, the merry band of outlaws, thence departed to Sherwood. No hang on, that was Robin Hood. We travelled to Little Stretton for the Mercia Hill Trial. 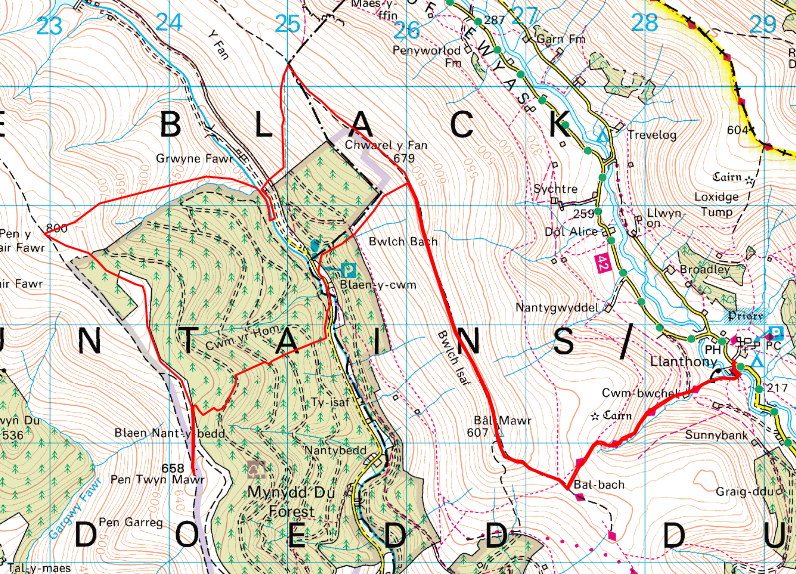 An eight plus mile navigational fell style race. As we neared our destination the sun came out to play - usurping my navigational advantage - but to be fair I didn't mind because it was a lovely day to be pootling around the Long Mynd. Vanessa and Judith set off a minute before me with the Crebernator bringing up the rear - ssh, stop it. Being a navigation event there's always a staggered start. Patrick was also on patrol but he'd headed out earlier. Out onto the course it was all fairly straight forward. Apart from my inability to run fast I had a good run. I pushed where I could push and plodded where I couldn't. Overall I was pleased with my routing bar one minor aberration from 7 to 8. Using the mightiest of all the super powers, hindsight, I really took a shocker. The when in doubt straight line gambit was an extremely poor choice as the heather infested, steep climb to Cow Ridge was a nightmare and much time was lost. Ho hum. The rest was fairly standard but most important, very enjoyable. I finished in a time of 2:04:48 and seventh place. I was really happy with that. Slightly unexpected but happy. It can only get better as the come back ensues. The rest of the Phantasmagorical Four faired better, winning prizes. So with the race run we made our exit, stage left and headed home. The results sheet at the time of departure. 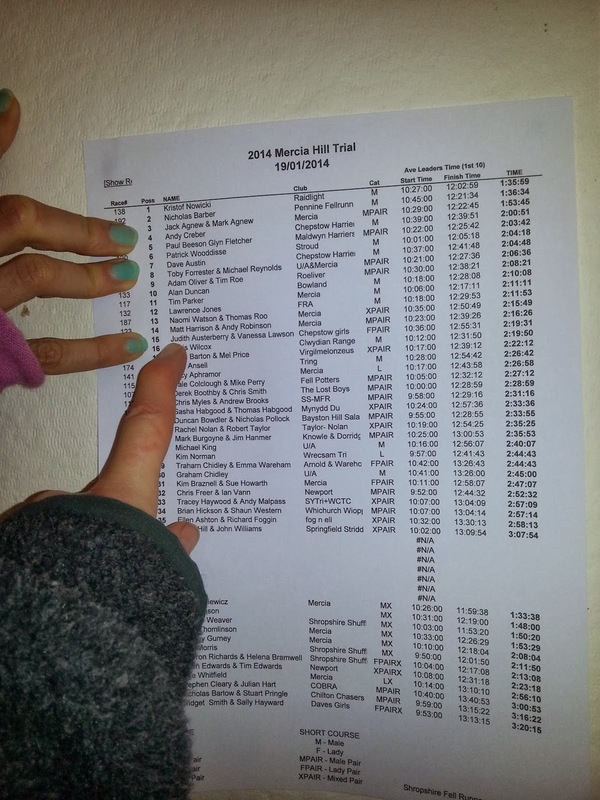 The Blue Fingernail and the lady with the mysterious furry arms point out the 4th (3rd solo), 7th (also ran) and 15th (1st female pair) on the Long Course. Also known as the sewage sump. Yes, it went wrong again. Not in a disastrous way but definitely not a good way. The pump is fine but it came free of the connection to the sewer pipe. Cue waiting in all day for the tanker to come empty it. And yes, I did miss the orienteering and yes, I was really looking forward to it. So having descended into pit - and yes, got covered in s.. - stopping there. It's reconnected but I'm not sure it's going to stay connected. I had to replace the jubilee clip and tightened it to the point where anymore and it'll break but I'm not sure... I think it might need some re-engineering. My neck is just about back to normal today but as that was on the mend I was suddenly stricken by a sore throat out of the blue. That's also feeling better today. All being well I shall be fit and ready for action tomorrow in the orienteering. Seventy five on the bike, watching the news and reading after a long old day at work. As stated yesterday, I am indeed, not happy today as my neck is still 'cricked'. It's better but not right. Going to make darting through the forest tomorrow night interesting. Reckon I might end up with whiplash by the time I finish the race. No reason for it but it makes one feel old. Turning ones whole body to view left or right is not a good look. As there was no reason for it I am expecting everything to be back to normal tomorrow - I shall not be happy if it's not... I've the night race on Thursday - I say night, but at 8pm it's more dark than night - to think about and I can't being doing that with a cricked neck. For those not in the know head to rogueruns.co.uk. The words 'bloody good fun' should spring to mind - especially if you're not all there - like me. I've put in quite a few hours cardio this week. I think it's been eleven hours worth. My legs did not feel strong as I pedalled to 120 minutes on the bike. Although my toe felt better I didn't want to aggravate it with a run. It's been quite a lazy day really but I think I needed it and I think I'll skip the cardio tomorrow to let the batteries recharge. The diet is still going strong though - which is nice. As planned I arose at 7am, got ready and headed out to Llanthony Priory. Things were looking good. The skies were clear, the sun shining, I expect the birds where chirping but it's hard to hear over the engine noise in the van and, as expected, it was chilly but that wasn't a problem. By the time I had completed my pre-flight checks I got underway on the journey of a thousand journeys just after 9am. I chugged along, up the windy, muddy path towards Bal Mawr. Halfway up the sun was just cresting the valley top, the brilliance of its rays, dazzling. From there it got chilly despite the sun. The winds were strong and coming from an unfavourable direction. I had to stop while crossing the Bal Mawr to Chwrlie watsit to put on my windproof layer. I enjoyed the drop down into the Grwyne Valley, electing for the out and back footbridge river crossing at the bottom rather than the normal wade across as the waters were running deep and fast. 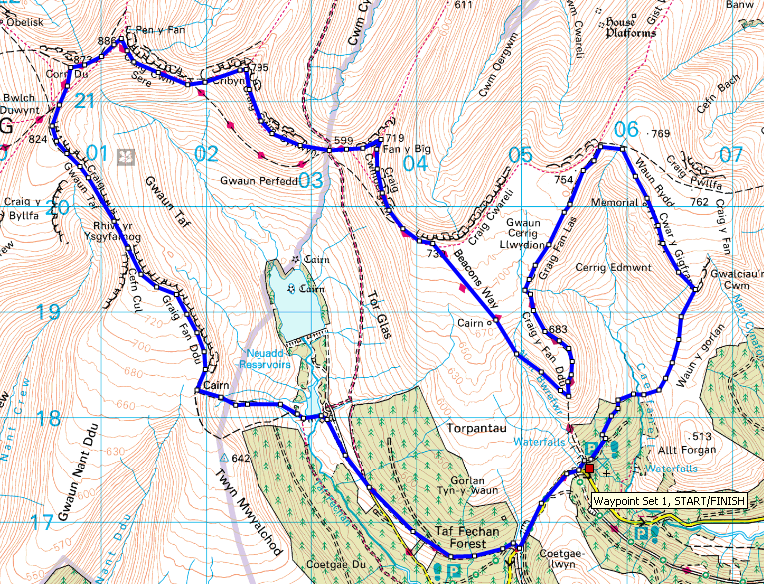 I didn't enjoy quite so much the slog up the other side to Pen y Gadir Fawr. Time has dulled the memory as to the unending false summits. By the time I hit the summit - and it was all taking far longer than I had hoped - dark clouds were forming to the north. I wanted to really get a move on but the gear box only has ahead, dead slow at the moment.. The run across to Pen Twyn Mawr was good running and not as wet as I was expecting. The wetness didn't really matter by then though because my feet where already soaked. Next up was the forest descent and I have to say the secret routes are almost too secret - even for me. The vegetation has really grown up. The top section is almost closed completely. At one point I thought I'd lost my touch, the forest before me was, well, forest, where once the path should have been. I pushed through the trees hopeful I still had it. I did and continued down to the forest track. The next section was equally overgrown and quite treacherous in places where the vegetation has grown over the narrow, deep path. I kept slipping as, fooled by the plants, the ground was often a foot lower than it appeared. Tomorrow is to be my first mountain run of the year and the first of my comeback. The forecast is looking just about as peachy as it can do this time of year. Might take an extra layer though, because it's no doubt going to be chillier than of late but all in all it shouldn't be too bad. Tonight I managed 75 minutes on the bike before hitting the sofa - and I don't think I'm going to be getting up any time soon. My legs are actually feeling quite tired from a full week of training. I'm not sure how much running I shall be doing tomorrow but I'll be happy just to get out there, heading along the ridge. I managed a lunch run - at lunch time, as opposed to a lunch run at tea. Martin skinned me again. Not unexpected. It wasn't my fastest but equal to my recent efforts and the wind was a bit in your face - that's as in my face - on the way out. 33:20 for the record so I can keep one and monitor my progress. Then I had a decent drive home. Managed to side step the accident on the A40, ducking down the 48 and then cross country. That could have been a twenty minute queue avoided. I followed up with 45 minutes catching up on the days news before possibly the quickest dinner ever - beating even Jamie. And was tasty. Tomato tuna pasta with grated parmesan in under ten minutes, cooked, dishes washed and on the table ready to eat. Now that's cooking. Oh, did I mention the 45 minutes was also a bike session. It was weekly shop night tonight. Normally Thursday's delight but I thought I'd get it out the way early. By the way, I have a feeling there's not going to be much talk of running tonight but heck, life's unfair sometimes. Anyway, as I cruised the veg isle - as you do, attempting to look like a new man with all sorts of healthy stuff in the singleton mini trolley, just in case - I had, what can only be described as a total brain spasm. There can be no other explanation for what occurred. I like to mix things up with a bit of random veg - ooh, living life on the edge, that's me. It gets me cooking different things - nothing wrong with that, you say and you'd be right - normally - but tonight, inexplicably, as I departed the veg isle for better pastures, there, staring up at me were leeks - okay, not too bad - and sprouts! Seriously! Leeks and sprouts! What the f*(k am I going to cook with leeks and frickin' sprouts. I'm hoping it was a one off. I am sticking to the task like a fly on a steaming horse turd. I can't say there hasn't been any snacking but I've kept it down to a minimum during the last ten days. So far so good. I managed a run of sorts early this evening and finished off with sixty minutes on the bike. Forget the storms - although that is very terrible - I've found flour weevils in my flour - not sure I really needed to quantify the location. Total disaster! A bakers worst nightmare - except, perhaps, a soggy bottom. Have had to chuck the entire contents of my flour shelf. Fortunately my jar stored strong and plain flour were clear so I was able to bake today's recipe, stem ginger shortbread. Going to source more kilner jars and restock - self-raising, wholemeal strong, type 0 for pasta, gluten-free, the list goes on, okay, actually it doesn't. Although not far, I just didn't fancy the drive across to the Kymin for 4 miles. The road conditions probably weren't too bad by the time of the race but having woken at 5am to the sound of torrential rain I really wasn't feeling up for it. The rain sounded so bad I had to get up and take a look, fearful of what might greet me. Thanfully the adjusted drainage was working a treat but after that I just lay in bed listening to the rain. Sleep deserting me. If I'm honest I'm probably going to race minimally over the next few months. Focusing more on training - aka actually doing some - and shedding the extra weight I have acquired over the last couple of years. On that front, it's still all systems go. I managed about 150 minutes of cardiovascular today which included a 30 minute run - in the mud. Good conditions if wallowing in mud is your thing. It really is very soggy out there. With the forecast looking decidedly un-good over the coming days I donned the waders and climbed back into the ditch. I rejigged the early catch leaf meshing to hopefully be a) more effective and b) easier to clear. Then I dug out about half a ton of leaves, twigs and branches. It was a bloody good upper body work out mind. Next up was the tax return - curse you tax man (or woman, I'm not sexist with my despisement). Jeez is it ever going to stop raining? If you're expecting to hear that I went for a run in this then you need to seek help. The flood waters are just about being held at bay - provided I don't stop raking the leaves from the grate now and then, that is. As long as the storm drain is kept clear it seems to be coping. Definitely can't afford for it to block up though. So it was ninety on the bike, watching cookery shows in between making and baking a french stick using my christmas banneton. It turned out great especially served up with some lovely olives wot someone gave me. Day four of the new regime has gone well. I've been snack free again. And so the focus remains - as, sadly, does the forecast for more flippin' rain. Grrrrrhhh.